February | 2010 | Always On! My client base, let alone my collection of personal interests, is, well, diverse. I work on the media/entertainment/publisher side, the agency side, and the marketer side. To keep up with all of this – and because I love them – I attend a lot of conferences, panels, programs, webinars, etc. And it is quite fascinating to note the differences – not so much in the content of the talks but the culture of the organizations and communities. Three weeks ago, I attended six days of non-stop social media events. The attendees at each stop on this massive media crawl uniformly carried Apple laptops and at least one Smart Phone – typically iPhone or Droid. They all had blogs and Twitter accounts, and most – it seemed – had Foursquare and/or Gowalla personas. And finally, the attire of those around me – not jeans and sneakers – which I would not wear anyway – but… suits and ties. Well, after all, there were a lot of ad salespeople, business development folks and senior executives, so that’s no surprise. So, putting aside all these cultural observations, what did I learn in school today. Well, to start, as you would expect, different cable/satellite operators are at different phases in their adoption of advanced technology. The leaders – as far as panelists – Cablevision and DirecTV – though Time Warner Cable’s sizzle reel was far and away the best, highlighting some very nice consumer offerings and interfaces including its highly touted “start over” function and an expansive VOD library. A point of commonality. Digital. 94% of Cablevision’s subscription base has digital cable, and all of DirecTV’s base (by definition of it’s being satellite) is digital. A digital footprint allows you to do cool things. So, what is Cablevision doing? A number of cool things. Some of it with Seth Haberman’s company Visible World. You may have read about their foray into addressable television over a year ago. It sounds like that, or at least part of that, was for Cablevision itself. Not a bad idea – test it out on yourself. And, also, a good test subject because they knew so much about their subscription base and were able to segment them by product line, e.g., TV only, Triple Play, TV and broadband, etc. Well, it sounds like the testing went well because they are rolling it out to other clients. The key statistic, if I understood it correctly was that consumers who were served targeted ads were 32% (i.e., one-third) less likely to turn away from the ad. Well, that makes sense and is quite a nice stat. Of course, I’m all in favor of relevant advertising. Even magazines get that concept. But, I wander. So, consumers like this stuff. In a recent Forrester/ANA study, 78% of advertisers said they want to target better. However… only 59% said they were willing to pay a premium for it. Sound familiar? Think behavioral advertising. One explanation came from Seth Haberman. First, he was curious to know who the 22% were who did not want to target better! Secondly, he pointed out that media buyers are trained to say, “I want to spend less.” It’s like a reflexive response. They have no control. So, Cablevision’s next foray is with Pillsbury (my client!) and Zenith (a wonderful agency to work with – particularly my key points of contact Neil and Colleen). They are creating a dedicated Pillsbury VOD (video-on-demand) channel in the Cablevision footprint. It will be paired with “Power 30s” (I believe Barry Frey said he had copyrighted that phrase), 30 second ads that are tagged to bring people to the VOD channel. But, now we’re getting technical. (1) It’s not their fault. Television is a large, capital intensive, fragmented (albeit a number of big cable & satellite provider fragmented) industry. To accomplish any advanced television initiative, you need a cable, satellite or telco operator; an advertiser and a technology partner at a minimum. There are a lot of different platforms and technologies and ideas and tests and legacy systems out there. It’s not easy to move that ship. Contrast this with Dennis Crowley’s simple little iPhone app. An iPhone app can be created for as little as a few thousand dollars. Even a $100,000 app is nothing compared to the television industry. Even $1 billion in online video advertising is less than 1.5% of TV ad dollars. (2) As a point of comparison – according to Seth Haberman – only 3% of video is consumed online. So, while these numbers are growing astronomically, and while new generations are simply not watching traditional television, it’s still a HUGE market. (3) “Sight, Sound and Motion.” These are the watchwords of the television community. This is what differentiates them from all other media. The POWER of the sight, sound and motion they can deliver. The web, said Rich Forester, VP of Ad Sales for DirecTV, is our closer, but it’s big video that gets them there. (4) For some, Advanced TV is more “now” than for others, but all-in-all, it won’t be here for 5 years. Advertisers – and media buyers – are simply overwhelmed. The biggest need, from what I heard, is for EDUCATION. There are too many new technologies, new technology companies and options. Moreover, advertisers want to know what they will get for their investment in this new, premium, advanced type of advertising. But that’s the problem with being part of the vanguard, we just don’t know. Hence, many brands are waiting it out. There are tests, successful tests. But nothing scalable. Ultimately, advertisers need something at a national level, and MSOs need to sell the rest of their inventory as well as these special programs. As DirecTV’s Forester said, we’re happy to create these targeted programs, but we have thousands of thirty-second spots that need to be supported. The inference is that you don’t get to do an advanced campaign unless you do a large traditional media buy. Is that a good place to stop? Does it cover the 3 hours of panels and schmoozing of the afternoon? Well, I think it hits on the highlights. Moreover, it’s time for my regularly scheduled program. Until next time, good night and good luck. On Friday night I ate corn bread, a popover, Caesar salad, lamb and heavily buttered spinach. On Saturday, I followed up my yoga class with Pad Thai at Penang. Sunday morning I had an all you can eat brunch that started with a preparatory spin class, fruit and couscous but progressed to French Toast, a cheese and vegetable omelet and a little chocolate cupcake. Sunday night, I buried my exhaustion in a never-ending progression of Chinese food in belated celebration of the new year. On Monday, I warmed up leftover Chinese food on my way to my Advanced Television seminar. And Monday night, I finished the binge with Ethnic Cuisine organic yet spicy Pad Thai. Early Tuesday morning, I regretted and repented. On Tuesday I ate only an English muffin, rice pudding and an apple. But by Wednesday morning, I was still not recuperated enough for a full day of OMMA Metrics and Measurement beginning at 9am. Hence, I did not make it there until Vipin Mayer’s keynote at 1:45. Since I had an abbreviated day, I am going to start out with a cheat sheet of buzz words noted over the course of the afternoon that will give you a kick start at sounding like a digital metrics enthusiast! As it turns out, this concept is one that has been written about extensively and from many different angles over time and gained prominence in the last few years when Facebook’s Mark Zuckerberg used it in his May 2007 announcement that he was opening Facebook to third party application developers. According to Zuckerberg, a social graph is “the network of connections and relationships between people.” The existence of this network, or graph, is what underlies the success of Facebook and the power that Facebook offers to third party developers. By appealing to a single person on the Facebook platform, an application can be introduced to an entire lifelong collection of that person’s connections. A more technical – and visual description – of a social graph is as follows: If one were to render the various ways different people in a particular community were connected into a data structure, it would be a graph. In a social graph, each person is a “vertex,” i.e., node or point, and each relationship connecting two people is an “edge,” i.e., line. There can be multiple edges connecting people, e.g., Sue and I worked at Booz Allen, Sue and I are Facebook friends, Sue and I live in Manhattan). Edges in the social graph have a label that describes the relationship. 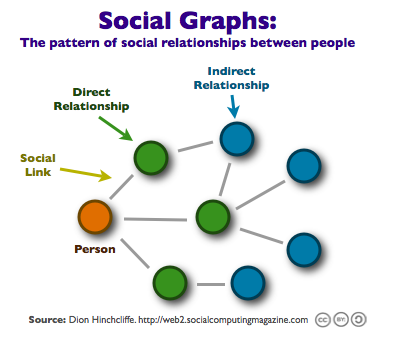 “A social graph is a diagram that illustrates interconnections among people, groups and organizations in a social network. 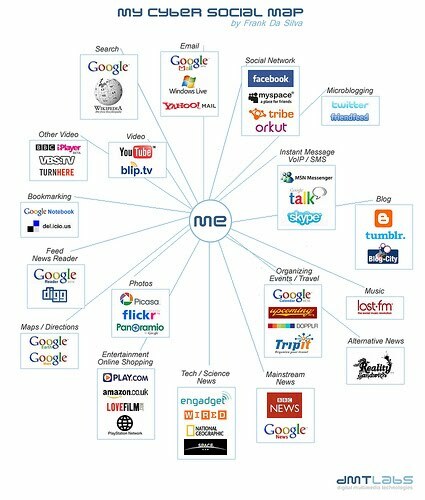 The term refers to both the social network itself and a diagram representing the network. Individuals and organizations, called actors, are nodes on the graph. Interdependencies, called ties, can be multiple and diverse, including such characteristics or concepts as age, gender, race, genealogy, chain of command, ideas, financial transactions, trade relationships, political affiliations, club memberships, occupation, education and economic status. Services such as Facebook facilitate the exchange of information, news, photographs, literary works, music, art, software, opinions or even money among users. In this environment, the social graph or for a particular user consists of the set of nodes and ties connected, directly or indirectly, to that actor. There are those who criticize the current system of recreating one’s social graph across multiple social platforms as inefficient and open to error. Starting at around the same time as Zuckerberg’s declaration, Plaxo began to offer a service that automatically merges your online networks. Personally, I prefer to maintain my networks manually. In fact, I – like many I know – have slightly different, although sometimes overlapping, graphs depending upon the online platform. For example, friends & family on Facebook, professional contacts on LinkedIn, digital media enthusiasts and experts on Twitter, and a random assortment of people on my IM buddy list. Time to get ready for bed to rest up for tomorrow’s OMMA behavioral conference. 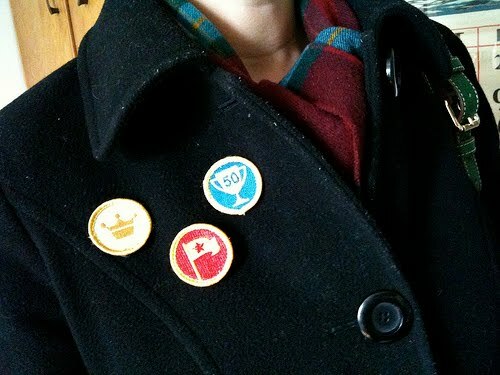 All I Want for Christmas Is a Foursquare Merit Badge – that I can pin on my coat! 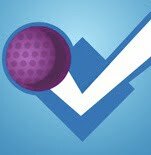 “Remember those real-world merit badges based on the virtual achievements you get for checking in to places using Foursquare that we told you about? They’re approved and on sale now. The 1.5-inch embroidered badges have Velcro on the back for attaching them to your jacket, backpack, or whatever other fabric you want to decorate. Options include Mari Sheibley-designed badges ‘Local,’ ‘Superstar,’ ‘Crunked,’ and ‘Super Mayor’ for $5.99 each. It’s unclear whether Foursquare is deriving any revenue from this recent development, but it does demonstrate that there is an opportunity for digital media companies to garner revenue from, don’t say it, consumers. Generally speaking, there are three sources of revenue for media and entertainment providers: (1) advertising & sponsorship (b) consumer and (c) strategic partnerships, revenue share, etc. In the past ten years, nearly all digital media companies abandoned the subscription model and with it consumer revenue as a viable and substantial source of income. (Not so their cable programmer brethren who, for now at least, have two sources of revenue – advertising and carriage/license fees.) But for digital publishers – and, particularly offline publishers going online, it seemed that Internet users would not pay for content, and advertising could carry the load for high quality and/or highly popular content. But Foursquare seems to be learning from the missteps of those before it. Albeit, it is also benefiting from the change in mindset created by iTunes and mobile gaming companies who have conditioned mobile (and iTunes) users to make micro-payments – little payments of 99 cents and up that add up to BIG dollars. Not only is Foursquare inspiring a (non-subscription) consumer-based line of revenue – 3rd party for now, i.e., the physical patches, but they are also developing high profile, high level strategic partnerships and custom programs with big name brands like Bravo, Intel and Zagat – giving it credibility, buzz, and access to the huge consumer bases of these mega-brands. Foursquare is an especially exciting platform because it takes social media back and forth between the physical and virtual world and directly touches the retail world. The potential value of the information collected by Foursquare about your day to day activities and the ability of retailers and other businesses to influence consumer behavior immediately and at a relevant, targeted level is immense. A few days ago, I heard Gary Vaynerchuk lambaste Facebook for letting virtual, social gaming organizations like Zynga make billions of dollars on Facebook’s platform. They should have ensured themselves a piece of that, he said. But Facebook, like Google and YouTube had an idea without a business plan – although it certainly (fortuitously?) worked out well for Google in the end. Dennis Crowley and his colleagues at Foursquare seem to be a little more aware of creative monetization options from the start. Chris Anderson famously talks about the Fremium model – a cute word for an age-old concept that seemed to have been forgotten or abandoned or not viable for the last 10 years – in the digital world. Is that what these badges are? Well, sure. You can earn a virtual badge for free. But for $6, you can get a real one from Nerd Merit Badges. But, you might say, don’t you remember the Twitter and Facebook pillows? Well, no, I don’t – but I just read about them… anyway, what differentiates Foursquare is the gaming element. That’s what makes a physical merit badge more desirable than a Friend Feed Pillow. Adam Penenberg, the author of “Viral Loop: From Facebook to Twitter, How Today’s Smartest Businesses Grow Themselves” – and the Forbes.com guy who broke the “Shattered Glass” story, said recently that instead of consumers spending billions of dollars on virtual items in online games, advertisers should be giving us real items for our online accomplishments. (Hmmm… sounds kind of like loyalty clubs, but now we have the platform to make it truly scalable – you didn’t think I could go a whole entry on this topic without saying scalable, did you? – but I digress) Well, he’s on to something, but Nerd Merit Badges has turned Adam’s idea and currently practices on their heads. What is happening is that a virtual game is crossing over the real world. Real dollars are being spent on real goods that are the physical manifestations of virtual items. It’s all pretty exciting. I hope that traditional media companies are watching and learning. p.s. Last night I unlocked the “Gym Rat” merit badge for visiting the Harvard Club 10x in the last 30 days. Unfortunately, the club is not a place I go to work out but rather to eat… so I’m probably not getting the physical fitness benefits Foursquare thinks I am. Content Is the Salt and Pepper. Social Media is the Steak. I’ve just walked home in my doctor-disapproved pointy toed boots from a Bill Sobel event at the Samsung Experience featuring Gary Vaynerchuk, aka Gary V.
I didn’t start taking notes until 15 minutes into the talk because I was recording it and attempting to single-process by giving him my full attention. But after a bevvy of great tweetable takeaways, I broke down and pulled out my Moleskine notebook. As with other such entries, I apologize from the start for not having digested and synthesized this, but such is the world of the blog. Gary Vaynerchuk was born in Belarus in 1975 and emigrated to the U.S. in 1978. From a platform as co-owner and Director of Operations of Wine Library, a wine retail shop in Springfield, New Jersey, Vaynerchuk gained fame as the host of Wine Library TV, a daily internet webcast on the subject of wine. Vaynerchuk’s informal style, described as “unpretentious, gonzo approach to wine appreciation” is in contrast to conservative wine industry norms. Vaynerchuk refers to his followers as “Vayniacs” and “Vayner Nation.” Conversely, his hyperactive on-screen delivery has caused criticism from some of the wine purist audience. He is scheduled to be a (or the?) keynote speaker at South by Southwest. We live in a day and age when you can care first. This comment really made me pause and think. It’s something we’ve observed but that has not been communicated so authentically. What does he mean? Well, we are all familiar with the Twitter marketing practice of reaching out to a Tweeter who mentions your brand or yourself via a Twitter reply. Comcast set the standard, turning its reputation around from the YouTube image of a repairman napping on a customer’s sofa to the now-famous Comcast Cares program. I personally have experienced it when Zappos responded to a tweet about my positive experience with them by tweeting back that they hope I enjoy my new sneakers, and when American Express replied to a tweet about a payment mistake I had made (directing my payment to an inactive AMEX card and therefore becoming delinquent on a current one) by offering to sort out what they said was a pretty straightforward situation. Internet people don’t buy stuff. We live in a thank you economy. People bought his book as a thank you for all the free stuff he had been giving them – videocasts, advice, blogging, etc. He had built a powerful loyalty and following. If you don’t like people, you can never be a brand in social media. He attributes much of his success to the fact that he simply loves people, which he sought to demonstrate by saying “hi” back to each person during Q&A – by name. I am East Coast for East Coast. I’m hoping this stands on its own – it resonated with the upper west side audience. The Internet is only 15 years old. Advertising campaigns should always include an interactive element to extend the story and capture the data. Why couldn’t I have been as eloquent when asked that question, i.e., should ad campaigns include a digital element, by an advertising agency executive today? I am obsessed with geolocation. Sound familiar? If you can make people show up at your store if you give them something, that’s worth a lot. McDonalds knows this. Gary has invested in Gowalla. Pownce could have won out with Twitter if its founders had not put all their attention into Digg. And this comment about FourSquare also followed a discussion of a partnership between Starbucks and Burger King. These brands, he said, are smart enough to see the value of leveraging each other’s audience. So, summing up the trends to watch: Smart TVs, 3D TV, geolocation, augmented reality, the semantic web. Companies need to have patience [an attribute that has served him well]. It’s about dating not hooking up. These companies are acting like teenage boys. They want to buy a company and then cash in. It’s a marathon, not a sprint. Look at the difference in brand recognition between Huffington Post, TechCrunch and Mashable vis a vis Fast Company, Inc. and… [I can’t remember the third.] The distance is shrinking quickly. Regarding Google Buzz: Let’s check out the neighborhood. This in response to clients who frantically want to know what they should be doing with Google Buzz. Regarding the iPad: Consumers are trying to figure out how to use it – that’s real brand equity. So true. As Galbraith said so many years ago, supply creates demand. People know there must be something special about it if Apple created it, and they want it, they’re just not sure why. Ok, the comments below are brilliant. When asked by a client, the NHL, how they would be able to measure the success of a social initiative, Gary said, “We’re gonna feel it.” Evidently, the client was not convinced. This led Gary to point out that we still haven’t figured out how to measure the value or success of traditional media. Now we all know the now hackneyed expression about knowing that half your ad dollars are wasted, etc. but Gary got more specific. How do we measure out of home/billboards? By calculating the average number of cars that drive by. But today everyone is on their hand held devices when they are driving. A valid point. I think equally valid for pedestrian traffic. The people on the streets of New York can hardly navigate the sidewalks while talking on the phone let alone looking at a hand held device and also noticing the billboards in Times Square. Ok, there’s more to say, but I’m exhausted so… hopefully… more later. The Future of Space & Time hosted by Wired.com: Exploring trends in lifecasting and the proliferation of location based services. More data was created in 2009 than in the entire preceding history of the Internet. This was also mentioned on Tuesday night’s Digital Cocktails panel. 2.0: Group Think. What do others think? Example: Amazon. Puts you in a group of people with similar attributes or interests or buying behavior and tells you what they think as a group. 3.0: Me-Based Query: What is best for ME? That’s what’s enabled by the semantic web. 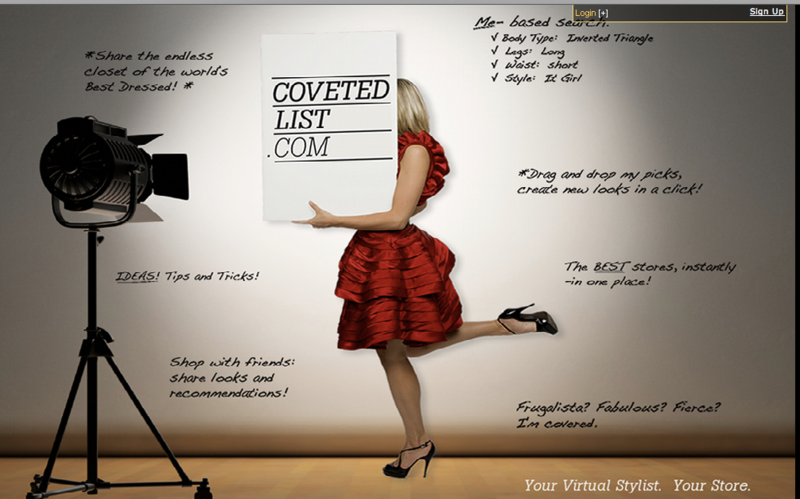 That is what will be possible through CovetedList.com: Social Shopping. So, as an aside, I have now been vindicated and, in fact, recognized as a personal innovator ahead of my time! for something I have been doing on Facebook. Starting in November of 2009, I discovered fabulous deals on designer dresses. I was picking up Missoni and Diane von Furstenberg dresses at Intermix and the DVF boutique for 70 and 60% off. Proud of and excited by my purchases, I created a photo album on Facebook, where I uploaded photos of the dresses that I tracked down via Google Image searches. This proved to be a useful resource as I was able to get the input of friends when deciding what to wear for a specific occasion. Note that I was not asking for shopping advice; I had handled that myself, particularly because these dresses were on sale and in short supply. But I did solicit advice post purchase. Back in the 70s – did she really go back that far, or did I misremember – “no one” thought that people would be willing to shop online. As with any online marketing, RELEVANCE is crucial. Consumers have always sought out advice from their friends and trusted networks when it comes to shopping. In today’s networked world, social media is becoming an integral part of that experience. An increasing number of sites that offer community advice and reviews are gaining traction. Feeling good (or bad) about a purchase has become a public experience. Join us as we explore the intersection of social media and the shopping experience! Brooke Moreland is the founder of Fashism.com, a site that let’s users get instant crowdsourced feedback on their style and fashion purchases. Aliza Freud, a recognized expert on marketing and women’s insights, is the Founder and Chief Executive Officer of SheSpeaks, Inc. (www.shespeaks.com). SheSpeaks creates and operates consumer communities for brands that drive insights and brand advocacy. Following more than a decade in corporate, global brand management, Ms. Freud is acutely aware that in this era of increasing consumer control over media, marketers need to be smarter about winning consumers’ attention and about integrating rapidly-evolving social networking tactics into the marketing mix. She was inspired to create SheSpeaks in 2007, based on the principle that women would thrive in a dedicated online community where they could gather, connect with others and see the power of their voices in action. Since then, SheSpeaks has worked with leading brands, including Pepsi, P&G, Garnier, Heinz, Food Network, Philips, AOL and more, to launch, evaluate and generate buzz about their products and services among target audiences. David Reinke is a versatile general manager with over fifteen years experience in brand marketing, sales and operations within the consumer products and apparel industries. Currently, David is the CEO and founder of StyleHop, an innovative company that leverages social networking and specifically fashion enthusiasts to help retail apparel companies make better style-level inventory investments. Prior to founding StyleHop, he spent five years at Liz Claiborne. He was hired by the CEO after completing his MBA and accelerated through roles in operations, production, strategy, sales and planning. His last job at Liz was Vice President of DKNY Jeans where he managed a $70mm budget authorizing and negotiating all trade spending. While completing his MBA at Harvard, David was the President of the Retail & Apparel Club. Before business school David worked at Procter & Gamble in sales and brand management. Stephanie Agresta has been a force in the online marketing industry for nearly 15 years. An expert in social media, affiliate program management and Web 2.0 strategies, her mission is to connect people, ideas, products and services using digital technology in new and inventive ways. Stephanie has been instrumental in developing innovative digital media strategies for Fortune 500 brands including Microsoft, Windows Mobile and PepsiCo. 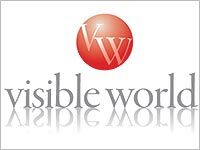 Stephanie started her career with iVillage, a women-focused Web destination and one of the first sites to build community online. She went on to hold prominent sales, marketing and business development roles with Internet powerhouses such as Barnes & Noble, Register.com and SpaFinder. With Commerce360, a search marketing firm funded by First Round Capital, she launched an affiliate marketing division and served on a management team alongside nationally recognized technology executives. Stephanie comes to Porter Novelli after five years of developing her successful personal consultancy, forging partnerships with digital thought leaders and emerging technology companies. Representing the best of both worlds, she is known for combining innovation and insight with the accountability, focus and superior execution that Fortune 100 brands demand. Stephanie holds a master’s degree in public affairs from the University of Minnesota and a bachelor’s from Luther College. She blogs at internetgeekgirl.com and affiliate-karma.com/blog, and she tweets @stephagresta. “I enjoyed your reading your recent post about the advent of hyper-local targeting.” Flattery will get you everywhere with me, and reading my blog is flattery on steroids. “Since you have an interest in location-based services, I thought you would be interested in learning about a new app called PlacePop. PlacePop is a new entrant into the geo-social networking space. Like Gowalla and Foursquare, PlacePop uses a check-in mechanism to connect people with the places they go to, anywhere in the world. However, PlacePop is designed to offer a much simpler user experience that provides value without such a strong focus on gaming elements. Our app is also designed to work well anywhere in the world, small towns and major cities alike. As an early adopter yourself, I thought you might be interested in taking the PlacePop app for a test drive. If you have some time to try it out, I would really love to hear your feedback on the product we have so far. Having had these two interactions and having heard FourSquare referenced nearly as frequently as Twitter and Facebook during the first two days of Social Media Week, I was convinced that hyper-local social media was indeed the next great thing, and that Four Square is the Facebook and Twitter of the space. As it was with LinkedIn and Facebook when I first joined, I find myself friending people I don’t really know in order to develop some kind of critical mass. And I know that as time goes on, I will become much more particular and possibly even jettison these connections if they prove to be creepy. In fact, I have already found myself ignoring requests from people to whom I see no ostensible connection except that they might perhaps like my photo. The challenge here is that I have not yet found a way to respond to these people to ask whether I actually know them. Is that functionality available? On the other side of the coin, I have sent friend requests to panelists that I see have checked in at the location of the event – although I follow up by introducing myself live and giving them the heads up. Near the end of today’s Social Media Week panel about defining the Social Media Editor Role (sponsored by Time Inc. and entitled “Networked News Gatherers”), I posed the following question to the panelists: What do you see as the intersection of hyper-local behavior and social media, and how will this impact you in your role as a social media editor. Rachel Sklar, Rachel Sklar, Business/Project Development, Abrams Research and Writer for Mediaites, answered that while she had been an enthusiastic member of FourSquare for a year (oh, how behind the times I feel), she did not yet see an application for it other than as a way to enhance her relationships with her friends. She did say that somewhere in a basement, a brilliant mind was developing an application that would expand the capabilities and role of the application – in the same way that Twitter evolved. Cyndi Stivers, Managing Editor, EW.com then added that a key attribute of FourSquare (and, I imagine Gowall), is the gaming element. And this made me realize that hyper-local targeting does not stand alone as the next great trend, but that the intersection of gaming and social media is integral to the development of this space – a la Farmville. Following the panel, I was approached by Phil Thomas Di Giulio, the founder of the pegshot mobile application – who, by the way, was lucky enough to be trapped in an elevator with Ann Curry at the conclusion of yesterday’s panel about the role of social media in the recent events in Haiti. Phil introduced me to this application and also uploaded photos of me, one of the speakers and himself – among others – to the site.